Six Flags New England (Agawam) — Heritage Surveys, Inc. 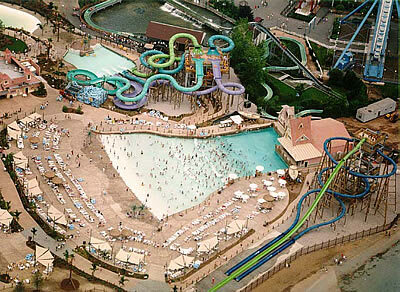 The Heritage Surveys team performed several surveys for Six Flags in 1999 and 2000 including: layouts for the water park, two new rides and the parking lots; boundary survey; aerial mapping; and wetland mapping. An overview of the highly rated Superman: Ride of Steel which opened with the grand opening of the park in 2000. Here is the Superman: Ride of Steel in action. 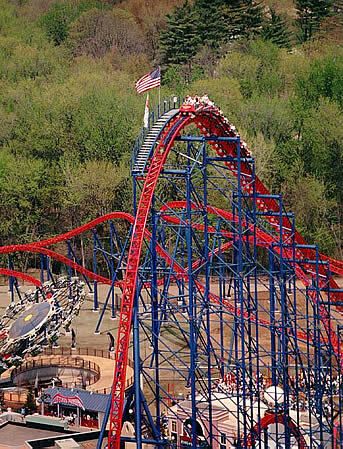 This rollercoaster was brand new when Six Flags New England opened its doors on May 5, 2000. It is very highly rated among rollercoaster enthusiasts. Here is a view of the section of Six Flags New England where the large ferris wheel and the water park, Hurricane Harbor,reside. It must have been a pretty warm day, given all the people in the tidal pool. In the background are boats zipping by on the Connecticut River. The cyclone offers a classic rollercoaster ride. It is one of the largest wooden coasters in the world. Built in 1983. A nice view of the waterpark, named Hurricane Harbor, after its opening at the end of May 2000. Six Flags New England is located on 235 acres in Agawam in Western Massachusetts near Springfield. Other towns in the area include Northampton, Southampton, Westfield, Easthampton and Chicopee. The amusement park was originally known as Riverside Park, which opened in 1840 as a trolley park. Riverside closed during the Depression but reopened in 1940, drawing in thrillseekers with Thunderbolt, a now classic wooden rollercoaster. Thunderbolt is still in operation and the original neon sign still shines. In 1997, Six Flags purchased Riverside Park and thus, began a huge renovation project. It officially became Six Flags New England on December 8, 1999. The grand opening took place on May 5, 2000. The park includes a water park called Hurricane Harbor and the Superman Ride of Steel, very highly rated by rollercoaster enthusiasts. The aerial photos above were taken during construction and after the grand opening of Six Flags New England.